It’s a busy time for McLaren right now. As part of the company’s $1.66-billion Track25 program, the automaker aims to launch as many as 18 new models by 2025, including a P1 successor and the 1,035-hp Speedtail hypercar. In a few months, the automaker will also unveil a new mystery grand tourer that will be sold outside of the existing Sports, Super and Ultimate Series models and is said to have the best power-to-weight ratio in its class. A new report by Autocar claims that McLaren is also working on two "extreme” bespoke projects for some very wealthy customers. However, we’ll only get to see them if the owners decide to show them to the public. McLaren has previously built one-off cars such as the X-1, which was shown at Pebble Beach in 2012. However, rumors suggest that one of the cars will be based on the extreme Vision GT Concept created for the Gran Turismo video game series back in 2017. The Vision GT Concept’s dramatic design showcases what a McLaren GT race car could potentially look like in 2030, so the production model will likely be track-only. The concept also featured an unconventional seating arrangement where the driver is not only centrally positioned but led on their front with the rest of the car "shrink wrapped” around them. Power is sourced from a hybrid powertrain with a twin-turbo 4.0-liter V8 driving the rear wheels and a pair of electric motors housed in each of the front wheels, delivering a combined output of 1,134 hp and 940 lb-ft of torque. 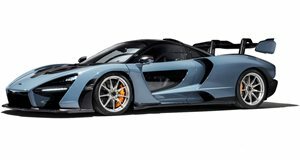 Lightweight carbon fiber is used extensively in the upper structure and body of the McLaren Ultimate Vision Gran Turismo as well as in the chassis, bringing the weight down to just 2,200 pounds. The concept also features advanced active aero technology called "Integrated Active Aero”, which uses tiny aperture around air inlets on key surfaces during cornering rather than moving the surfaces altogether to create drag and generate downforce. If the rumors are right, we’ll have to wait and see if the specifications of the one-off production car match the concept.